With the 4.2 release we have taken the opportunity to push the performance on GPU even further, as well as making some algorithmic improvements to the CPU rendering. This is the first public beta release in the Indigo 4.2 series. We have had a few internal releases, hence the 4.2.14 version number. * We have added high quality BVH building in the background and transparent swapping out from an initial fast BVH build. This allows the best of both worlds - the scene starts rendering (builds) as fast as possible, but keeps optimising in the background, and then switches to an acceleration structure that gives the fastest possible rendering in samples/second. 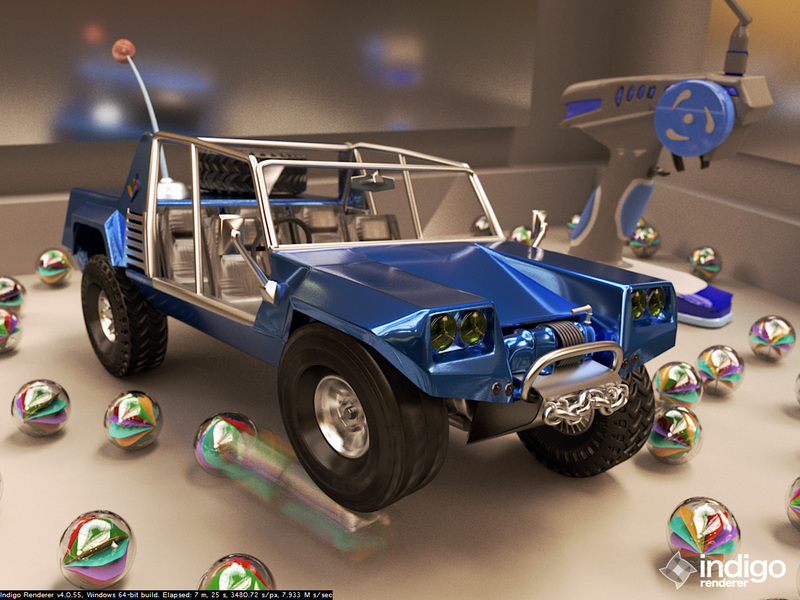 while we support instancing on the GPU (instancing is the duplication of objects in a scene without much increase in memory usage), if the scene can be rendered without instancing we can get big speedups. 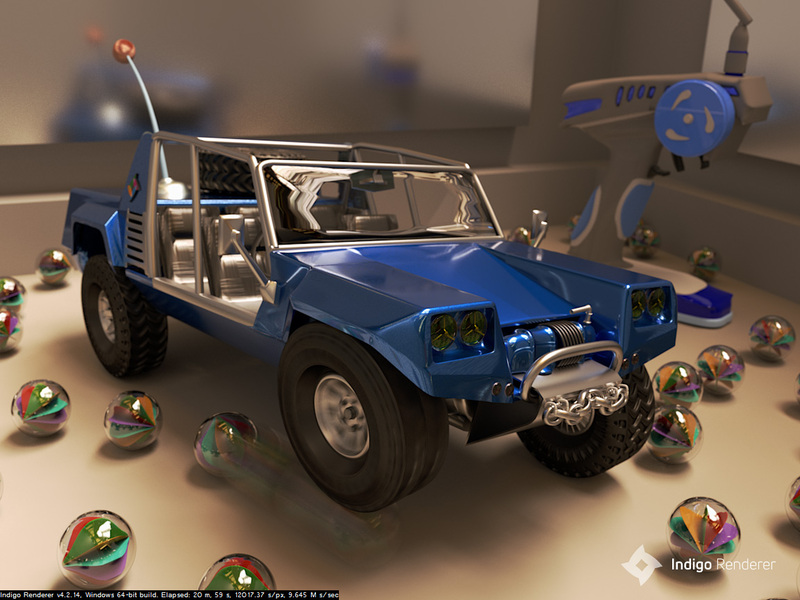 These two optimisations combined allow some scenes, such as interior scenes, to render up to 68% faster! We have made some optimisations on the CPU rendering side, but the biggest improvements are to do with smarter sampling of emitters. As you can see there is a large reduction in noise in Indigo 4.2. This improvement is a bit more subtle, but if you look closely you will see the noise is reduced in the Indigo 4.2 render. While optimisations are great, we know that many users are patiently waiting for some new features, such as AOVs. The development focus for the next period will therefore be on AOVs. A secondary item will be SSS support on GPU. We will be working on updating our plugin support in parallel with these core goals. * GPU: Added high quality BVH building in the background and swapping out from an initial fast BVH build. * GPU: Added 'allow_high_quality_bvh' render setting. * GPU: Added an optimisation for faster rendering if scene can be made to render without instancing. * Improved light sampling (light sampling based on distance, angle etc..). Only for CPU rendering currently. * CPU: Choosing samples between environment and interior lights more intelligently. * CPU: Improved sampling for environment emitters. * CPU: Optimised and fixed some issues with SSS and bidirectional path tracing. * Added 'Scene Info' widget. (available under Window menu) Shows scene build statistics, with extra details for GPU rendering. This is wonderful news! Thanks Ono and Glare team!!! The GPU is excellent, the materials are fine, but autoexposure of light sources makes me cry from my dullness. Very nice, but the very important feature is OpenVDB rendering is not supported . When Indigo got it ? Please ! This kind of material needs much dev work and optimization to alow a satisfying user experiance. Also most of Indigo users do architecture and object visualisation, so this would be an entire new userbase to conect to and to do so you need a awesome integration! Yup it would be cool. Zom-B has a very good point tho. A good integration is key. Ps: i leave a VDB reminder for the devs here. ;) in Bear form. Hey arc en ciel, thanks for the bugreport! You can doublecheck by simply switching to CPU rendering in the previous Indigo build and you'll see. Excellent! But I did not order caustics, and single-color details are difficult to distinguish. for me it looks like your red colour is a RGB 255 0 0. In the case I'm right your red material reacts like a mirrir reflection all (!!!) red light in a way that doesn't ocour in nature. Maximum for each RGBchanel schould be 204.
disabling in the renderer settings, disabling in the material or compositing tag. I think the best way to disable in the material, as the tag will not apply to individual groups of polygons. Thank you!